All you need to know is that this recipe is quick, easy, and delicious! 1. Over medium heat, fry up the bacon. When it's cooked thoroughly, remove from pan and let cool. 2. Toss the shallot (or onion) into the pan and stir to coat in grease. Cook for about 3 minutes. 4. 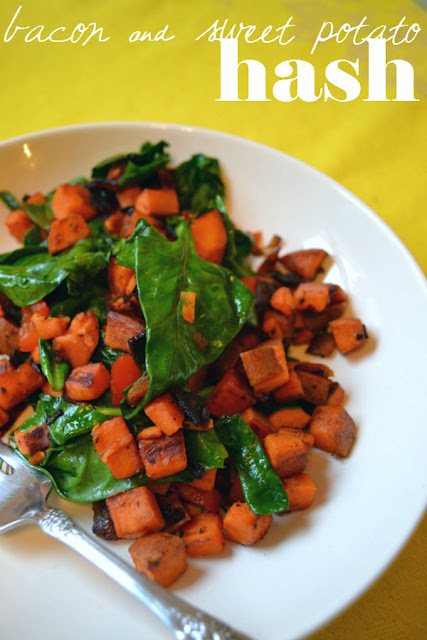 While the sweet potato is browning, chop up the bacon into little bits. 5. Add the bacon, bell pepper, and caraway seeds to the pan. Stir and let cook for another 5 minutes. 6. Now it's time to stir in the mustard, balsamic, and remaining spices. You can also throw in the spinach. 7. Reduce heat and cover. Let the spinach wilt a little. 8. Serve with a little extra mustard and ketchup, of course. That hash looks so legit.